This month famed French jewellery house Van Cleef & Arpels will be celebrating over 110 years of dazzling creations at its London store on New Bond Street. The Patrimonial Exhibition will showcase nearly 40 stunning vintage and heritage jewels created at Van Cleef & Arpels' Place Vendôme maison, including pieces owned by Elizabeth Taylor, H. R. H. Princess Fawzia of Egypt and H. H. Princess Salima Aga Khan. One of the oldest pieces on display is the Varuna butler's bell which was crafted in 1907, just two years after the opening of the first Van Cleef & Arpels boutique, and thought to have been ordered by New York society man Eugene Higgins. Made from ebony, enamel, rubies, gold and jasper it is one of Van Cleef & Arpel's greatest sea-inspired fine jewels. Click through to see more highlights from the exhibition. This month famed French jewellery house Van Cleef & Arpels will be celebrating over 110 years of dazzling creations at its London store on New Bond Street. The Patrimonial Exhibition will showcase nearly 40 stunning vintage and heritage jewels created at Van Cleef & Arpels' Place Vendôme maison, including pieces owned by Elizabeth Taylor, H. R. H. Princess Fawzia of Egypt and H. H. Princess Salima Aga Khan. One of the oldest pieces on display is the Varuna butler's bell which was crafted in 1907, just two years after the opening of the first Van Cleef & Arpels boutique, and thought to have been ordered by New York society man Eugene Higgins. Made from ebony, enamel, rubies, gold and jasper it is one of Van Cleef & Arpel's greatest sea-inspired fine jewels. Click through to see more highlights from the exhibition. Nature has always been one of Van Cleef & Arpels signature inspirations and the bird motif — as seen in this Oiseau clip from 1924 — is one that recurs throughout the house's history. Alongside its fine jewellery, Van Cleef & Arpels became a go-to name for chic Parisian women looking for cleverly designed necessaires, compacts and minaudières. 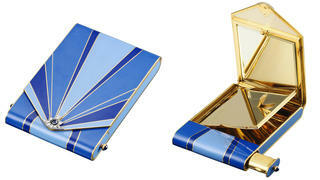 With a mirror, lipstick case and folding compartment for valuables or make-up, this blue enamelled design in gold from 1925 is a classic example. 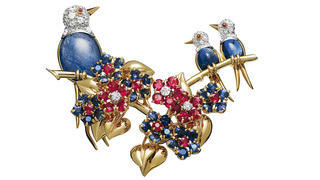 First appearing in 1920, The Inseparables is a detailed version of the house's bird inspiration and have appeared in numerous Van Cleef & Arpels collections as a symbol of love. Created in 1946 and set with rubies and sapphires, a similar clip from the same year far exceeded its $20,000 estimate when it reached $108,000 at a Christie's auction in 2006. Patented in 1933, the Mystery Setting technique has been a unique staple of Van Cleef & Arpels' collections ever since. The feat of craftsmanship allows the stones to exhibit their full brilliance while their setting remains invisible and can require hundreds of hours of painstaking handicraft for a single piece. 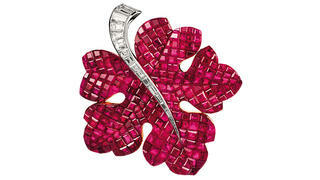 This fig leaf clip in ruby and diamond from 1951 is the perfect illustration. Reflecting the fascinations of the time, Van Cleef & Arpels has also taken inspiration from the cultures of the Far East throughout its history. This was particularly notable during the 1920s when the Universal exhibitions exposed society to the rich colours, silks, bronzes and other artefacts from China, Japan and Thailand. 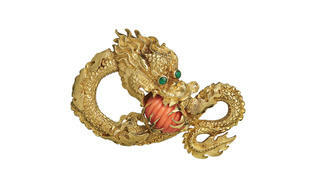 Changing fashions in the 1960s also brought about a new love for the Far East and contemporary jewels like the Dragon clip above, created in 1969, were the result. Of course, you don't create jewels as storied as those from Van Cleef & Arpels without coming into contact with a few celebrities and, alongside the incredible suites created for royal weddings and coronations over the years, the Walska brooch is one of the most enduring celebrity pieces. The brooch showcases a 95-carat yellow diamond which opera singer Ganna Walska had worn as a pendant in the 1930s. The diamond was auctioned in 1971 and the piece was ordered by the new owner to celebrate the birth of her son. 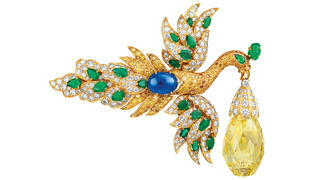 As with many Van Cleef and Arpels designs, the brooch is also a piece of transformable jewellery with the wings becoming earrings and the diamond remaining a pendant if desired. The Van Cleef & Arpels Patrimonial Exhibition is open to the public until March 15, 2017 at 9 New Bond Street, London. 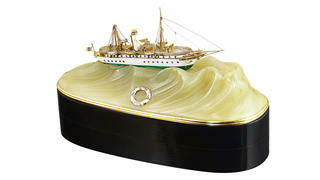 Visit vancleefarpels.com. Of course, you don't create jewels as storied as those from Van Cleef & Arpels without coming into contact with a few celebrities and, alongside the incredible suites created for royal weddings and coronations over the years, the Walska brooch is one of the most enduring celebrity pieces. The brooch showcases a 95-carat yellow diamond which opera singer Ganna Walska had worn as a pendant in the 1930s. The diamond was auctioned in 1971 and the piece was ordered by the new owner to celebrate the birth of her son. As with many Van Cleef and Arpels designs, the brooch is also a piece of transformable jewellery with the wings becoming earrings and the diamond remaining a pendant if desired. The Van Cleef & Arpels Patrimonial Exhibition is open to the public until March 15, 2017 at 9 New Bond Street, London. 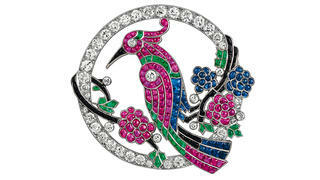 Visit vancleefarpels.com.